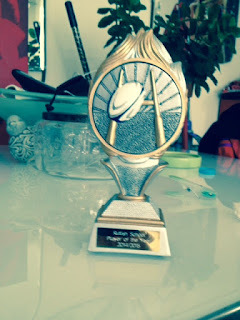 Here is a pretty shoddy phone camera shot of the Bomber's school rugby player of the year award. What can I say about my lack of photography skills? At least the trophy is recorded for me to look back on now. He dropped out of athletics last night as he was "too tired" and he can't do the YDL meeting on Sunday as he is away with Alex at Alfie's birthday. Pre season rugby training starts next Wednesday, and as he far prefers that to track and field, it looks like we might be done with javelin and 400m for another season. It is a pity as he has a real talent for them, but what can you do? Become a fixer, not just a fixture.
" going to be brutal"